Ticks can do that to you. I never think about ticks during the holiday season, but a news release from the University of Cincinnati about how “Hungry Ticks Work Harder to Find You” piqued my interest--and memories of the day our family inadvertently “collected” a total of 14 ticks. Ticks, as you know, feed on blood. They feed on blood as larvae, nymphs and adults. Ticks "spend most of their lives on the ground in tall grass, patiently biding their time for a victim and presumably ignoring their rumbling stomachs,” Miller wrote in his news story. Fact is, ticks are very good at waiting, waiting to ambush you. They can reach near starvation because their metabolism slows. “In the absence of any host cues, they go into a dormant state where they don't move around a lot,” UC biology professor Joshua Benoit related. Another discovery: the UC biologists found that genes associated with a starved tick's salivary glands activated those glands. “Saliva is known to help ticks drink more blood more quickly, a useful ability when you're clinging precariously to a moving animal in thick brush," Miller wrote. "The sticky saliva also helps cement the tick to the host." 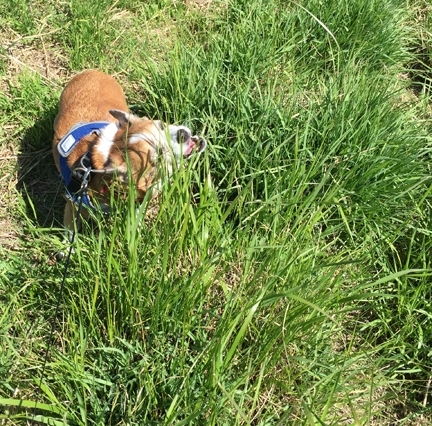 It was April 14, and the two of us and two dogs were walking through a tall grassy area in Sonoma, enjoying the poppies, fresh vegetation and the springlike weather. When we returned home, we found a total of 14 ticks: 13 either in or on our hair, skin or clothing, and one attached to our Chihuahua mix. 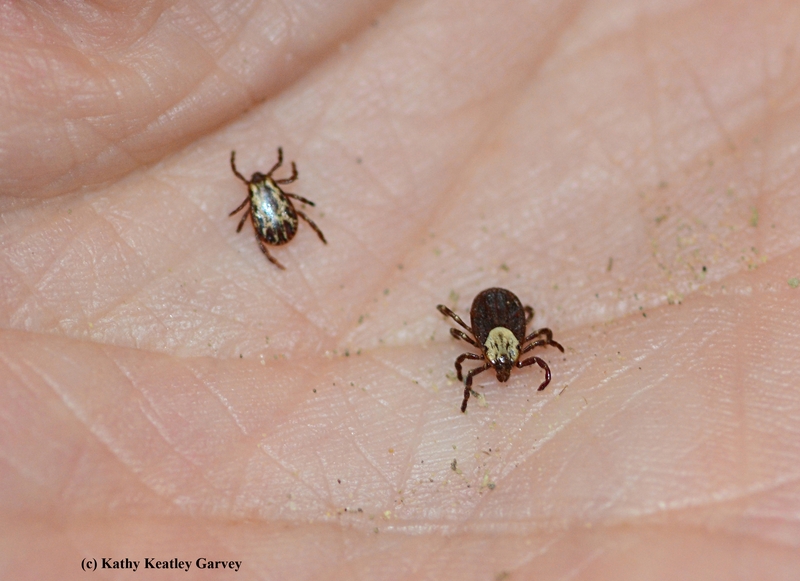 Lynn Kimsey, director of the Bohart Museum of Entomology and professor of entomology at UC Davis, identified them as Dermacentor occidentalis (Pacific Coast tick). Thankfully, this species does not transmit Lyme disease. We never thought about wearing a repellent that day, but a spokesperson at the Sacramento-Yolo Mosquito and Vector Control District's booth at UC Davis Picnic Day last April said she sprays her clothing with "Off" before she dons the clothing and ventures out into tall grass or brushy areas--or where ticks are likely to be. The brochure indicates that "Ticks do not fly, jump, or fall out of trees! They are usually found in grassy areas, in brush, or in a wooded area. They wait on the tips of vegetation for a human or other animal host to pass by. As the host brushes against it, the tick makes contact, looks for a suitable location, and begins the feeding process." And "contrary to popular belief, ticks DO NOT embed their heads in skin. Ticks are equipped with mouthparts adapted to penetrate and hold fast in the skin of its host. Additionally, they secrete a cement-like material that helps them stay attached to their host." Yes, they do. One tick embedded itself in my ear.